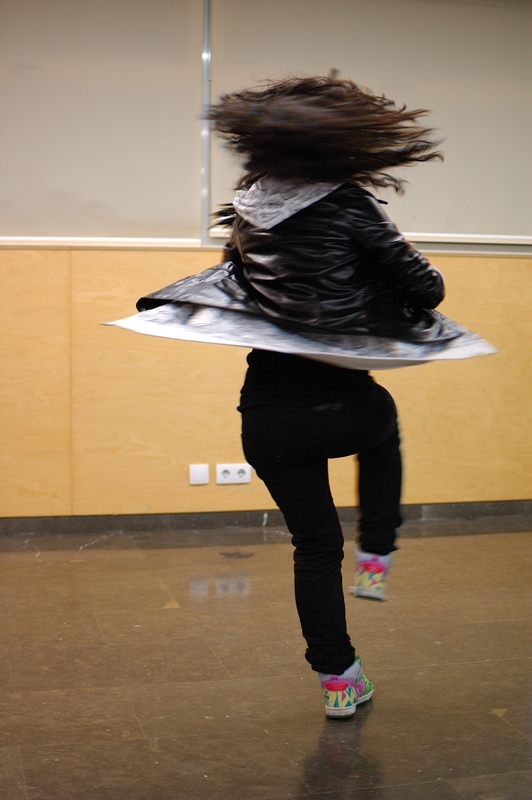 My daughter's young hip-hop teacher during a performance in La Masia cultural center in Nou Barris. I couldn't know less about hip-hop being from the old school and born in 63 but I have to admit that movements rock and look swell in a photograph. The most interesting thing was not in isolated frames (come too think of it if it weren't for the clothes and shoes there is no hint of hip hop in this shot) but in the full series: hip-hop dancer. I know it isn't Morocco, but it reminds me of a whirling Dervish. Hola Carlos. Because you like the art, please have a look here STAR! What a very good photography ! Please have a nice start into the new month and week as well. Love the inventiveness of hip hop dance. I'd like to know how her top half can be spinning while her bottom half is not. If you dance, I will personally photography you!